I was doing a lot of trail biking before sciatica hit (a little over two months ago). Sciatica is a general term for lower back pain caused by the sciatic nerve being pinched. It’s pretty darn painful and has kept me off my feet for several weeks. Well, it still hurts but I’m sick of blobbing around the house, watching Korean dramas. OK Well I’m not sick of watching Korean dramas at all but as I live in Southern California and it was a lovely 70 degree day in late December, it was due time to take out the glorious road bike. I gave them all 20 minutes and then went for a nice leisurely hour long ride along the LA River. 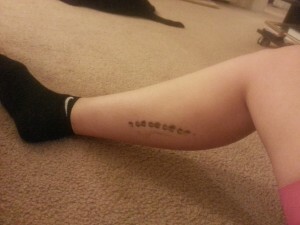 When I got back, I realized I had such a pure and genuince cyclist tramp stamp that you could make out each chain ring on my leg. The battery for the shifters is right next to the gear chain, so my hands got covered in grease. 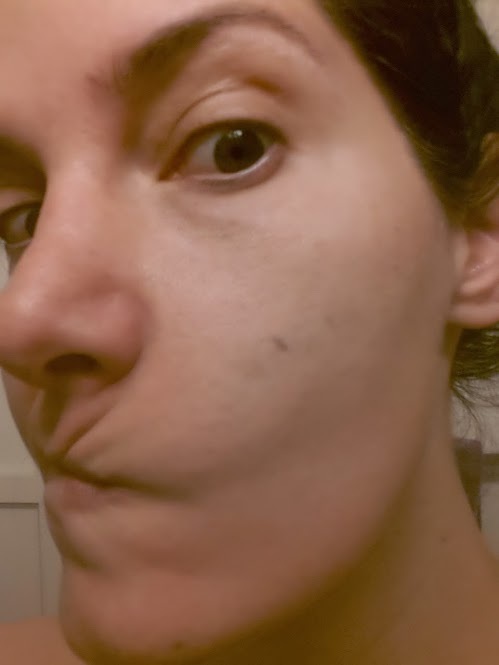 Which means my face got it, too (I think this is the first time in recent history I got bike grease on my FACE). I think we as cyclists need to rise up and appreciate the cyclist tramp stamp that dons our left legs. Either that, or find a better way to get the darn grease off – I scrubbed and scrubbed with a loofa and there is still a faint gear chain on my leg!